No More Vise Handle to Struggle with, No Bad Part Loads! The 4th-Axis Vertical workholding system can be ordered with any number of chucking stations that will fit within your machine’s table travel. Hydraulic models come with a Tailstock Unit that has through-the-tailstock hydraulics and an available built-in automatic brake for rotational stability while machining. The internal hydraulic brake provides a more rigid4th-axis vertical fixturing setup. • A custom 4th-axis table with sequenced built-in pulldown clamps for machining several different sizes of diesel engine cylinder heads is pictured. • The PROHOLD® hydraulic pump has two circuits – one for the hydraulic brake and the other to operate the pulldown clamps. • The brake is released and activated by the machine control M function when indexing the table. • The swing clamp circuit pressure is independently adjustable from the brake circuit. The 4th-Axis four sided hydraulic vise is available with a Tailstock Unit that has through-the-tailstock hydraulics and an available built-in automatic brake for rotational stability while machining. The Quadraulic™ Vise System combined with a PROHOLD® two circuit pump will directly replace any four sided mechanical vise you are using on your machine today. It doesn’t require our tailstock with brake to operate. We just need the trunion diameter of your tailstock support and what size 4″, 6″ or 8″ vise you want to use. 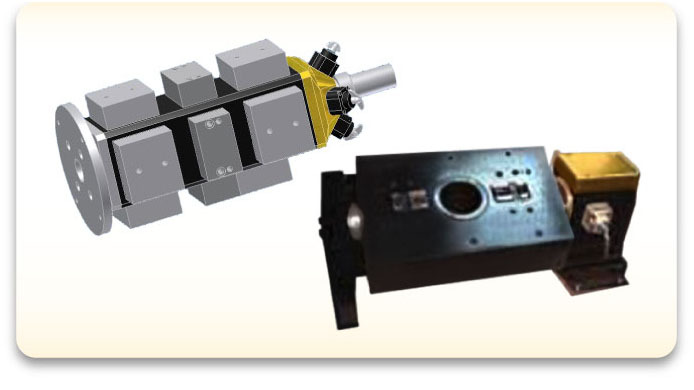 The ergonomics and part quality repeatability of this vise package is unbeatable. For more information on our 4th Axis Verical Fixturing please fill out the form below and a representative will get back to you as soon as possible.